The standard electropolishing process for SRF cavities requires a mixture of strong, potentially hazardous acids to smooth the inner surfaces of the cavities, allowing them to reach high gradients. Researchers at Fermilab and Faraday Technology Inc. have developed a new water-based process that would be both safer for workers and more environmentally friendly. In June, the Fermilab team finished successfully testing the second high-gradient, single-cell, 1.3-GHz cavity electropolished with the new process. 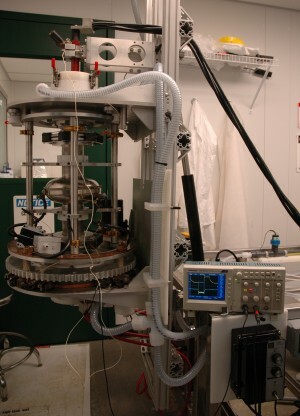 They found the tested cavity’s performance to be almost equivalent to the performance of cavities polished using the ILC baseline technique, based on harsh, concentrated acids. In addition to using a safer solution, the new method uses a more controllable electric current to drive the polishing process. It also requires a simpler setup. In the currently used electropolishing process, the cavity rotates around an aluminum rod — the cathode — while the cavity’s inner wall is partially immersed in a concentrated electrolyte solution of hydrofluoric and sulfuric acid. 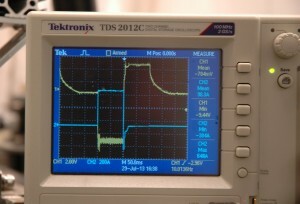 Then, an operator applies a negative direct current voltage to the rod. The current in conjunction with the viscous electrolyte solution smooths atomic-scale roughness on the surface of the cavity wall. During the process, an oxide layer builds up on the cavity wall. To achieve the required surface smoothness, this layer must be removed – which is the primary function of the hydrofluoric acid. In the new technique, an operator applies a pulsed reverse current, rather than a direct current, to the rod. Unlike the direct current, this current cycles between pulses of positive and negative voltages at specific times about 10 times a second. By adjusting the timing and intensity of the pulses, the technician can use the positive pulses to smooth the cavity and the negative pulses to remove the oxide layer without requiring viscous and strong acids. “Rather than using the concentrated sulfuric-plus-hydrofluoric acid chemistry, which is required for the direct-current applications, the pulsed reverse (current) enables us to use a very simple water chemistry with a low concentration of about 5 percent sulfuric acid,” said E. Jennings Taylor, founder and chief technical officer of Faraday Technology, the company that initially developed the new technique. Various aspects of the process are the subject of US and foreign patents and patents pending. Fermilab and Faraday were also able to simplify the electropolishing setup. Polishing with strong viscous acids requires cavities to be rotated in a horizontal orientation – a position that is more prone to leaks and requires a complicated rotating and tipping mechanical system. The new technique, using a non-rotating vertical setup, produces better polishing on single-cell cavities than the rotating horizontal setup. “It’s much more amenable to an industrial-scale process,” Taylor said. Fermilab partnered with Faraday Technology around three years ago to begin this project, which is funded by the American Recovery and Reinvestment Act. Faraday Technology had developed a similar technique for electropolishing automobile gears and semiconductor valves. After the partners adapted the process for SRF cavities, the Fermilab team tested the performance of two single-cell cavities polished with this method. In vertical tests, the single-cell cavities demonstrated an accelerating gradient greater than 30 megavolts per metre in several instances and a quality factor above 1.5 x 1010. The maximum gradients approached 45 megavolts per metre with a quality factor of 1 x 1010. The ILC standards, currently achieved using the standard method, are a gradient of 35 megavolts per metre and a quality factor of 8 x 109. Researchers also found that the new technique could be used as a “drop-in” technology, meaning it could be used with existing electropolishing tools — or with the simpler vertical polishing tool. Rowe hopes to further optimise the process with a few more single-cell cavities before moving to multicell cavities, like the nine-cell cavities needed for the ILC. In the standard niobium cavity electropolish procedure, i.e., the procedure that relies on hydrofluoric acid, the voltage applied to the aluminum rod is negative with respect to the cavity, not positive as stated in this article. The direction of current flow is from the cavity (the anode) to the aluminum rod (the cathode). Thanks, Anthony. You’re right, of course: the cathode always has the negative electrode attached to it. We’ve corrected the text to reflect this.